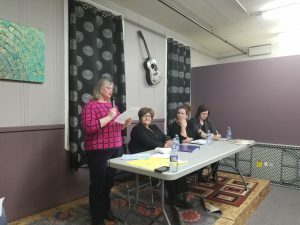 On January 24, 2019, CUPE Local 5430 organized a standing room only town hall meeting in Grenfell to talk about the closure of Grenfell Pioneer Home and the impact the loss of jobs and residents has had on the community. Speakers included NDP MLA and health critic Vicki Mowat, NDP seniors’ critic Danielle Chartier, CUPE 5430 President Sandra Seitz and community residents Lois Warner and Joyce Maier. The event was emceed by Region 3 General Vice President Scott McDonald. Speaking on behalf of CUPE, Seitz spoke eloquently about the need to invest in long-term care. In 2014, an assessment report of all health facilities in the province found that Grenfell Pioneer Home, at the time 47 years old, had almost $5 million in infrastructure needs. Nothing was done. Then, two years later in 2016, the northeast wing of the home was closed because of safety issues. Eight residents had to be located to other communities. Nothing was done to re-open the wing. Another two years pass, and now the home is permanently closed. Want to get involved in the fight for public long-term care in Grenfell? Email Nancy at cupesec@sasktel.com to join the campaign or call CUPE Local 5430 at 306-546-2185.